The voice of change, Claire represents her 5th grade friends in raising awareness and bottle caps for a great cause. This week’s guest blogger is a 5th grader, Claire Robbins. Claire writes as a representative of the 5th grade class recycling program. Did you know that 5th graders run The Lexington School’s school-wide recycling program, and it is the first such school-wide recycling program in Fayette County? It is an environmentally responsible endeavor that starts in a single classroom’s big blue basket, and like sound waves, it bounces down hallways out doorways to larger Lexington and a MUCH larger planet. Recycling is more than the right thing to do; it is a way to show how connected the world really is. 5th grader Claire gets it. 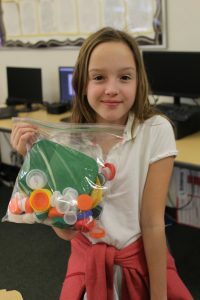 Beyond getting it, she shares a new 5th grade recycling initiative that incorporates Design Thinking to strategically raise two hundred pounds of plastic bottle caps for the construction of a park bench. Together 5th grade has collected data on why recycling is essential and how they might impact change. Here is Claire’s argument for bottle caps to benches, how recycling can function at The Lexington School. Hi, I’m Claire, and I’d like to talk to you about bottle caps. I bet you are staring at this and saying to yourself, “What? Why bottle caps?” Do you wonder what could be so important about bottle caps? Keep reading! My school is collecting plastic bottle caps to make a bench. It would be nice for our school to have, and it benefits everyone. People can read, talk with each other and sit on a bench. That’s not the only reason we’re collecting caps. Bottle caps are harmful to our environment. Animals everywhere are dying. What is your favorite sea animal? Chances are that animal will die because it has eaten bottle caps. The Great Pacific Garbage Patch is a huge ocean garbage dump twice the size of Texas. Weighing 7 million tons and nine feet deep, this can kill more than 100,000 animals a year! Let’s put it this way: have you ever seen an animal smiling after it just ate trash? Not likely! I challenge you to a contest. The person with the most bottle caps wins a prize! We need 200 pounds by March 2017! To make a bench, we need plastic. Some ideas: water bottle caps, lids, gatorade caps, laundry detergent caps, air freshener caps, and any other plastic cap. NO METAL PLEASE. We encourage you to clean your bottle caps before sending them. Please include your number of bottle caps and phone number so if you win we can contact you. On behalf of the 5th Grade and The Lexington School, I send you thanks and hope you participate! According to Mrs. Heidi Simons, 5th grade Language Arts and Social Studies teacher, the team needs 80 pounds more by March 17th. I am so proud to be Claire’s great aunt and am excited to see that my 35 yrs of recycling has rubbed off on her. I will start collecting bottle tops straight away! I have been collecting for this cause and gave the students who collect the caps from our rooms , a copy paper box 3/4 full of caps ! They were excited ! I’m working on another box now!! Great idea!! this is one of my favorite projects the lexington school has ever done. so proud TLS is teaching our kids to think of ways to protect their environment and make an impact on the world around them. 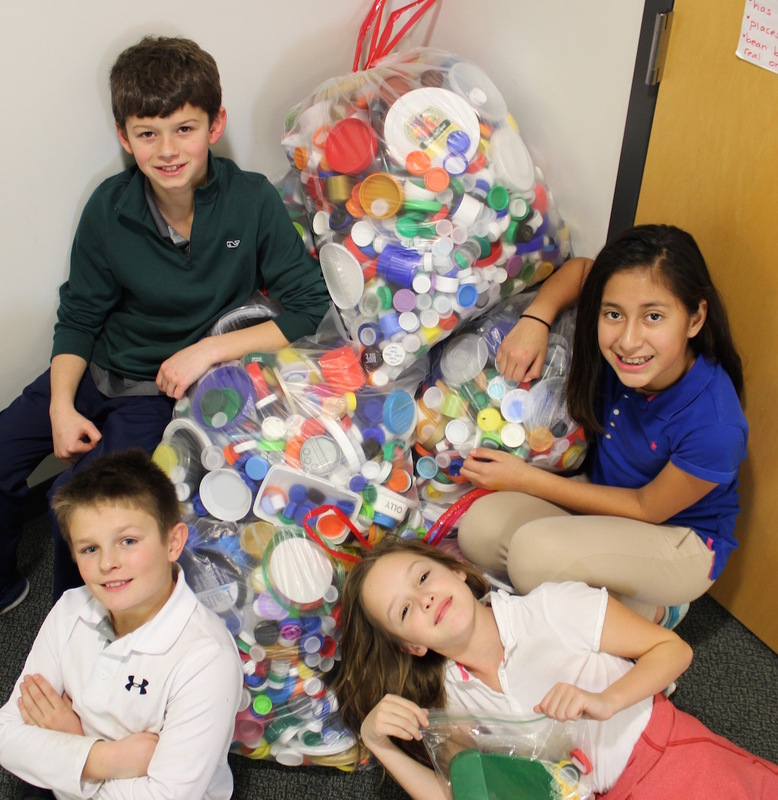 We are so proud of you Claire & your friends & we are collecting bottle caps in Fla! Next door neighbor here will be collecting for you, Claire. What a great writer you are, too! Do you accept sandy bottle caps from Florida? Great story! I wish you overwhelming success and a campus full of recycled benches! Thanks for a great blog/article, Claire! Your articulate explanations and your obvious enthusiasm make this a wonderful project for TLS. We are sooo proud of you and your fifth grade friends and teachers!